13729: Autocrat desk set: black hard rubber lever-filler with green and white taper, gold filled trim, 18.8 cm long, with jade and black molded celluloid base with advertising imprint for a prominent Midwestern wallpaper company. Second-tier manufacture but clean condition and striking use of materials, 14K gold nib is a good writer. 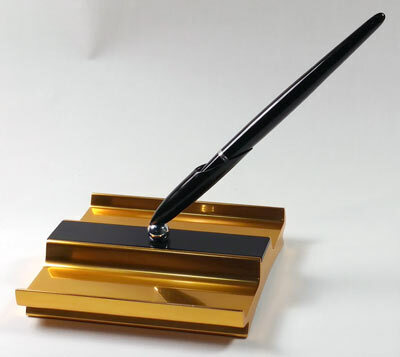 13732: Mabie Todd Swan desk set: massive rectangular stone base, 11.6 x 17 x 2.6 cm, clean with natural internal layering as shown, desk pen is late USA manufacture, brown pearl and black striped lever-filler, gold filled trim, 19.4 cm long including Swan nib. Mabie Todd desk sets are not common, still less late examples of this sort. 13537: Parker 51 desk set: elegant midcentury modern ensemble with rare Red Band button-filler desk pen, sharp barrel imprint with 3rd quarter date code; original synthetic sac is shown in the photo but has been replaced, original sac will be included; base is hefty gold-finished metal, 12.5 cm by 11.3 cm, very clean with only light marks on the black center panel, labels on bottom perfect. "Magnetix" swiveling socket is a Moholy-Nagy design for Parker. Red Band 51s are extraordinarily hard to find, as they were recalled almost immediately upon release. 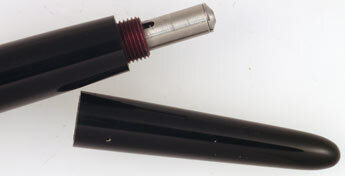 12114: Sheaffer Lifetime Touchdown desk pens: matched pair of black pneumatic-fillers, 17.3 cm long, White Dots on tapers, large two-tone conical Triumph nibs; large size with thick bbls, slight swelling at end of bbls over seal location. 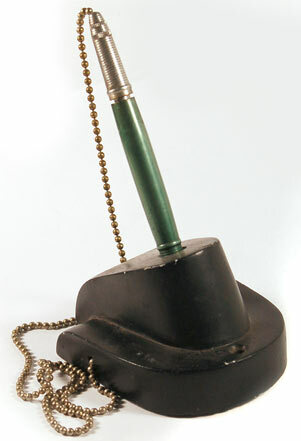 11646: Waterman desk pencil: green pearl, 20.2 cm long, gold filled trim, barrel 10.6 mm in diameter (same size as Patrician pencils), uses 1.1 mm lead, mechanism propels and retracts; new old stock, minimal shop wear, splotches on nose cone are due to flaking clear lacquer originally applied as a protective coat. 11636: Waterman desk pencil: black celluloid, 18.6 cm long, chrome plated trim, barrel 10 mm in diameter, uses 1.1 mm lead, mechanism propels and retracts; new old stock, minimal shop wear. 11635: Waterman desk pencil: green pearl, 20.2 cm long, gold filled trim, barrel 10.6 mm in diameter (same size as Patrician pencils), uses 1.1 mm lead, mechanism propels and retracts; new old stock, minimal shop wear, splotches on nose cone are due to flaking clear lacquer originally applied as a protective coat.